CB Insights, a strategic intelligence firm, gathered up the biggest trends in retail and analyzed where they stand as the year gets underway. 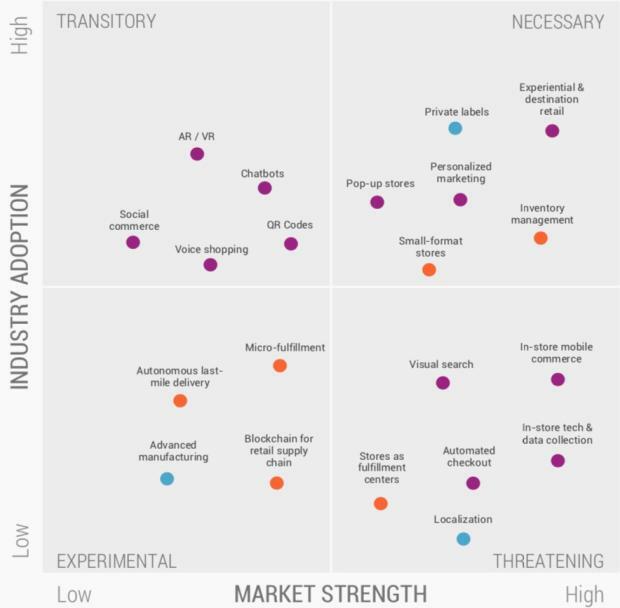 The resulting matrix, based on what CB Insights calls its NExTT framework, offers a picture of the changes set to have a high impact in the near term, and the ideas that are likely to become increasingly important in the future. On one axis is how widely adopted the trend is, taking into account factors such as the momentum of startups in the space. On the other is the trend’s “market strength,” determined by the quality and number of investors behind it, investments in R&D, forecasts of its market size, and other indicators. Experimental: Trends that are in their early stages or have proofs of concept, but that haven’t produced many useful products or aren’t widely adopted in the marketplace yet. Transitory: Ideas that retailers have been rolling out, but where there’s still a lot of uncertainly about their value and how retailers can best use them. Threatening: These have a large potential market and investment capital flowing into them, but only the earliest adopters have so far put them into practice. Necessary: The stuff with a clear, understandable value that lots of retailers have already put into place and shoppers are actively using. At this point, companies should already have plans for how to make use of these in 2019. The dot colors in the chart refer to what part of the retail industry the trend affects. Blue is product, purple is merchandising, and orange is supply chain and distribution. As we kickoff this year and provide recommendations to help our clients innovate and meet customer needs – we must consider where the market is heading, and where trends lie in terms of adoption. Today, NPR announced RAD, a new, open-sourced podcast analytics technology that was developed in partnership with nearly 30 companies from the podcasting industry. The technology aims to help publishers collect more comprehensive and standardized listening metrics from across platforms. Specifically, the technology gives publishers — and therefore their advertisers, as well — access to a wide range of listener metrics, including downloads, starts and stops, completed ad or credit listens, partial ad or credit listens, ad or credit skips and content quartiles. However, the technology stops short of offering detailed user profiles, and cannot be used to re-target or track listeners, the site notes. It’s still anonymized, aggregated statistics. It’s worth pointing out that RAD is not the first time podcasters have been able to track engagement. Major platforms, including Apple Podcast Anlytics., today offer granular and anonymized data, including listens. This isn’t your average tracking platform. It’s open-source and connects anonymized data that cannot be used to track and re-target listeners, while providing a tracking mechanism everyone can use. RAD helps creators and advertisers know which part listeners actually hear to improve the listener experience. HBO has created applications — known as “skills” on the Amazon Echo devices — to promote its shows and characters. This year, it introduced Westworld: The Maze, a choose-your-own-adventure-style game for superfans of “Westworld.” (A dramatic trailer for the game ends with a narrator intoning, “Alexa — open Westworld.”) More recently, it introduced a skill starring characters from its new show from Sesame Workshop, “Esme & Roy,” in which children can use the speaker to answer questions and play along. Both games can be played without the aid of screens. Unilever has created a recipes skill under its Hellmann’s label, while Procter & Gamble has introduced features from Tide and Oral-B. Those using the Tide application can ask Alexa how to remove juice or grass stains from clothing, while Oral-B’s offers a tooth-brushing timer. On Google Home, where the term “skills” is replaced by “actions,” Estée Lauder has one for personalized beauty advice and Disney has some games for children. Marketers have been rushing to figure out where their brands fit in a world populated by voice assistants and smart speakers. While questions remain about privacy and security, data from Comscore in October showed that more than 20 million homes in the United States, or 22 percent of those with Wi-Fi, use the devices. By 2022, more than half of American homes will have a smart speaker, according to Juniper Research. The “Esme & Roy” skill, which was created with Sesame Workshop, showed the potential for smart speakers with children and their parents. Amazon has been seeking child-friendly voice applications, particularly now that it sells an Echo device meant for children, Ms. Caluori said. At the same time, she said, young parents such as herself are keen on smart speakers, partly because they’re a screen-free alternative to tablets and phones. Marketers say the data they are getting back from Amazon and Google has been relatively thin so far. It can include the amount of time people spent engaging with a skill and the number of sessions that were started and completed, Ms. Klaassen of 360i said. Ms. Reubenstein said her firm typically got basic data on which questions to Alexa were completed or not. But once, in a meeting with Amazon, the firm briefly got a deeper look, seeing snippets of queries for one client’s Alexa skill that showed how customers can still be easily frustrated when navigating a voice application. “We started seeing a lot of cuss words in the user flow,” said Ms. Reubenstein, who declined to name the client. She said they were able to identify at what point most users were getting frustrated and adjusted the skill to address the issue. These are still early days for marketing on voice devices. Ms. Reubenstein compared it to when brands began making apps for mobile devices. But over time, she said, voice interactions will begin to replace many of the activities that people are conducting on screens. It is still early for marketing on voice devices – but we’ve seen creative efforts this year from brands who’ve experimented in the space. Gary Vaynerchuk even hosted the first-ever ‘VoiceCon’ focused on the rise of voice and digital audio. With the increasing importance of ‘voice’, it will be exciting to see where it goes in 2019 and how we can utilize this thinking for our clients as we define their customers’ experiences. Rising rents for brick-and-mortar locations and competition from online retailers have left many storefronts in New York City unoccupied for months at a time. One digital startup is looking to take advantage of that real estate for advertising. Burrow – think Casper for couches – will advertise in five storefronts in New York City this month, promoting its modular sofas that are supposedly easy to assemble and are delivered in compact boxes to cut down on shipping time and costs. 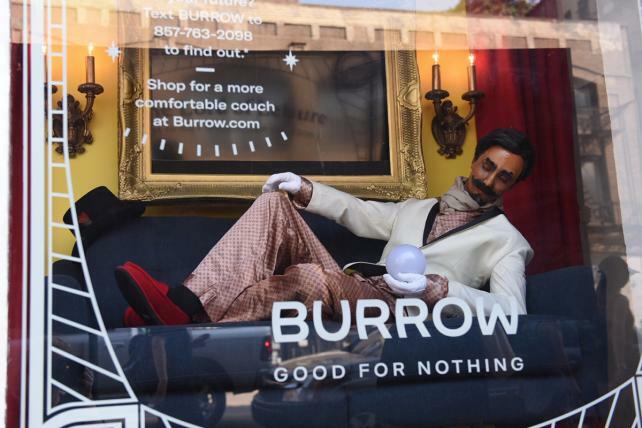 Burrow, which worked with branding firm Red Antler on the concept, has set up an animatronic fortune teller, so-called the Lord of Leisure, in these store windows. The Zoltar-like figure sits reclined on a Burrow sofa and tells passersby their fortune through text messaging. The fortune teller will respond to the text with a fortune tied to leisure and relaxation, a core message of Burrow. Those who participate are eligible to win a free Burrow couch. As foot traffic to stores decline, real estate developers will need to think of new applications for these spaces. Digitally native startups have an appetite for this, and are finding innovative ways to use OOH advertising – especially to make a big splash in a new market. The fashion industry is not for the undisciplined–or the slow-moving. Customers change their preferences seemingly as fast as they can scroll through their Instagram feeds. Case in point: Once-hot brands such as Nasty Gal and American Apparel are worth a fraction of what they once were. The company scouts for niche designers that can’t be found at Barneys or Macy’s and analyzes how the brands perform on the site. Revolve can tell the designers exactly what customers are looking for, such as more mid-length dresses or a particular shirt color. The company says that designers who are receptive to this data often will see their sales improve. “Everything the company does stems from data,” says Gerona. The company’s inventory process is another example. Revolve’s reordering platform automatically pushes out a notification to buyers on a daily basis when an item is selling quickly. A tagging system–which tracks every detail on a piece of clothing from its length to its buttons–allows the team to easily distinguish or collect data on the designer, look, and cut. While the automation helps, humans ultimately step in to make the decisions. “If we take a risk on a trend and can see it doing extremely well, we can qualitatively distinguish how future styles will sell,” she says. Revolve manufactures and designs 18 of its own brands, a move that helps it stay nimble and ahead of trends. The clothes are manufactured in China and India as well as locally in L.A. Gerona says the company can ask its 40 or so designers to create something around what’s trending and can expect the garments to arrive on its site in weeks. Revolve says it can target exactly what customers want. “This marrying of data and buyers and the designers has been incredibly successful for the business and it continues to grow exponentially year over year,” she says. Scroll through Revolve’s Instagram–with its 2.4 million followers–and you’ll see photos of these influencers, clad in the company’s clothing, taking tropical weekend getaways, brunching with friends on Sundays, or attending Coachella. The attraction is not just the clothing but also the aspirational lifestyle that caters to the Millennial audience. “Our customer wants a piece of that lifestyle,” Gerona says. Revolve has designed a bullet-proof strategy grounded in the millennial audience. They found a way to build a a data informed fast-fashion company that harnesses the power of influencer marketing. Thus far, it’s been a winning combination. AMC, the largest theater chain in America, has announced it will now offer a subscription service that lets moviegoers watch up to 3 movies a week for a monthly charge of $19.95. Called AMC Stubs A-List, the subscription will function as a branch of AMC’s loyalty program, starting June 26. According to the AMC press release, the online and smartphone-based subscription will allow members to watch multiple movies a day and let you see movies more than once. Plus, you get discounts at the concession stand, there are no online ticketing fees, and you can make reservations in advance. AMC temporarily blocked MoviePass access to big city theaters earlier this year. On Wednesday, MoviePass responded on Twitter. …it’s not looking good for MoviePass. Even at a higher price, AMC has the largest market share of all theaters. Unless MoviePass has large enough following, loyalty AND capital to open their own theaters; it’s going to be challenging to scale up to AMC. Uber has drawn up a plan for AI that detects a user’s drunken behavior to accommodate them before they get into the backseat. The system, described by members of Uber’s Trust & Safety team in 2016 and published yesterday, tracks how someone typically uses Uber’s app: how quickly they type (and with how many typos), how precisely they click on buttons, their walking speed, and the way their phone is typically held or dropped on any given day. Someone who hails a car to get home after hitting the bars probably won’t be the best at typing out their home address or walking too quickly (if at all). Factors like these are plugged into Uber’s planned algorithm, along with details about when and where the ride was requested. A late-night Uber call or one that’s from an area loaded with bars, would tip the system off about a rider’s sobriety differently than a daytime call from the suburbs. Although this could enhance the rider experience for those who carpool, and arm the drivers with information on the rider’s state before they get in the car, there are also some clear issues. It could deter drivers from picking up passengers, perhaps forcing them to drive, or could act as a draw for assault. It will be interesting to see how this unravels; it appears it could cause more issues than it could mitigate..
Mercedes Benz is launching an app-based subscription service that will give drivers access to different luxury vehicle for up to $2,995 a month. Mercedes is offering two plans: Signature for $1,095 a month and Reserve $1,595 a month. A one-time $495 joining fee is also required. Each plan includes insurance, roadside assistance, service, and maintenance as well as a “personal concierge” who will flip you from one vehicle to another. That makes Mercedes’ plan notably cheaper than comparable subscription services by BMW ($2,000–$3,700 / month), Porsche ($2,000–$3,000 / month), and Cadillac ($1,500 / month). For now, the service is just a pilot. The monthly subscription called Mercedes-Benz Collection will be tested in Nashville and Philadelphia. BMW’s U.S. subscription pilot, which launched in April for up $3,700 a month, is also in Nashville. But the subscription service could expand as customers shift away from owning vehicles and move towards short-term rental services like car2go and peer-to-peer options, such as Turo. The automotive industry has been shifting to mobility as a service, and even luxury brands will have to respond to this new ecosystem and provide the same level of flexibility, convenience, and cost-savings to compete. Facebook is invading Tinder’s space with a new set of dating features. It will let people opt in to creating a dating profile on Facebook. It will only be visible to non-friends who also opted into dating. Facebook will match you by a slew of preferences. And because it has more data on you than any other app, it could deliver more relevant matches. The feature will start testing later this year. Facebook explains that “potential matches will be recommended based on dating preferences, things in common, and mutual friends. They’ll have the option to discover others with similar interests through their Groups or Events.” TechCrunch suggested that Facebook build a feature like this in February. Based on Facebook’s wealth of data and ubiquitous experience, it is no surprise they are entering the dating space. There is no doubt that Facebook is primed for this. However, there are some concerns. 1. Facebook has long fought with the fake profile – and a dating service could only make that “cat fishing” problem worse. 2. It will create a new level of data intimacy that would have great value to marketers. With all of the data privacy issues Facebook is facing currently, it brings Facebook’s priorities into question. Spotify Technology SA plans to start raising prices in Norway next month, a small-market test that may foreshadow increases for its global listeners later. Prices for new customers will go up by 10 percent in May, and extend to existing users in July, the company said. The increase will apply to all three of Spotify’s paid offerings in the country — the standard subscription, a student plan and a family plan. “In order to meet market demands and conditions, while continuing to offer a great personalized service, Spotify will be increasing the price of our premium subscription in Norway,” the company said in a statement. Prices in the U.S. range from $5 to $15 a month. After going public earlier this month, Spotify is eager to prove to investors that it has a path to profitability. The company operates at a loss due to high royalty payments to the music industry, costs that have hobbled rivals Pandora Media Inc. and Deezer. Raising prices represents a way to boost sales and margins without seeking concessions from the recording industry. Netflix Inc., another online service with high costs and low margins, has employed price increases to great effect over the past couple years. The company has boosted its average subscriber price by more than 12 percent in the past year. Lack of loyalty to specific brands is trend we are seeing across industries. Since Spotify’s discounting strategy is what hooked many users initially, it will be interesting to see the outcome of this test and understand the implications of price on loyalty. Stay tuned! In November 2017, IKEA created an innovative survey about co-living spaces. This study explores what the future of co-living will look like in 2030 when there are 1.2 billion more people on the planet with 70% living in urban areas with limited spaces and resources. IKEA’s future living research lab Space10 launched One Shared House 2030 developed by interaction designer Irene Pereya of Anton & Irene. This is an interactive take on customer research. The Survey: is engineered as a digital experience. Everything from the empathetic positioning to the sonic // visual design pulls you in. IKEA demonstrates that CX is something that should trickle across all aspects of your business – even market research. The Results: show that no co-living company has really figured out the right balance between an economically feasible scale and a scale that favors human connections. It shows that there is still ripe opportunity to re-think the co-living space. Farewell, cashier jobs. Following the launch of Amazon’s cashless, cashier-free Amazon Go convenience store in Seattle, a startup called AiFi is emerging from stealth today to announce the availability of its own checkout-free solution for retailers. But unlike Amazon Go, AiFi claims its A.I., sensor and camera network-based system can scale from a small mom-and-pop all the way up to a big retailer with tens of thousands of square feet and a hundred thousand products. Similar to Amazon, AiFi’s system involves cameras, sensors and A.I. technology to identify what shoppers grab from the store’s shelves. Also like Amazon’s Go store, shoppers will have to use a companion smartphone app, where their payment information is stored. However, Gu says AiFi is designed to scale – it can support tracking up to 500 people, and tens of thousands of SKU item numbers. In addition to monitoring the products – AiFi monitors the people, too. 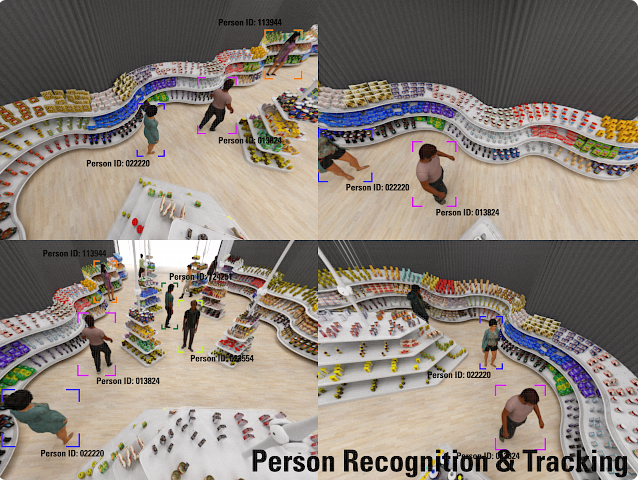 That is, it can track shoppers’ behavior in the store, including things like if they’re shopping in groups, what items they’re picking up and putting back, their gait, their body poses, where they go in the store, and even identify if they’re doing something abnormal, like shoplifting. In addition, AiFi’s business model won’t be based on the hardware, but a subscription fee associated with continuing usage of the system. The company may also move into payments in the future, too, instead of integrating its checkout with third-party processors. AiFi has presented a scalable solution that offers convenience for shoppers and increased inventory management capabilities for retailers. Retailers don’t need to have Amazon’s scale to deliver on convenience. Since launching the company in 2011 as a direct-to-consumer clothing brand committed to “radical transparency,” Preysman and his team have been strategically expanding its scope. Defying the reign of fast-fashion heavyweights like Zara and H&M, Everlane has used its website and social media handles to offer customers a glimpse into its factories around the world, give voice to the workers making its garments, and share a price breakdown of each product it sells. Shoppers can see that Everlane’s original $15 American-made tee costs $6.50 to produce—and that the company’s markup is significantly less than the $45 that traditional designer brands tack on. Everlane’s forthright messaging, coupled with its spare, fashion-forward aesthetic, has turned customers into emissaries—and inspired a slew of upstart fashion brands, such as shoemaker M.Gemi and technical clothier Aday. “Everlane provided a model for how to communicate that our quality is what we say it is,” says Scott Gabrielson, founder of accessories startup Oliver Cabell. Preysman is also pioneering new approaches to retailing, making use of steady product launches, waiting lists, and limited inventory to both predict and drive demand. “Everlane created a sense of urgency and exclusivity [around its products],” says Marshal Cohen, an analyst with market research firm NPD. Everlane uses its waiting lists, along with real-time data and customer feedback, to make inventory decisions. When in doubt, it stocks less. And when items sell out—which happens a lot—Everlane can restock quickly, thanks to its close relationships with its more than two dozen factories worldwide. All of this generates the specter of scarcity, which Preysman leverages: Customers sign up for early access to new clothes and to be notified when popular ones are back. Last year, when Everlane’s new ballet-inspired heels sold out within three days, 28,000 people added their names to the waiting list. This steady communication with customers is so important to Preysman that, until a few weeks ago, he was involved in drafting every single email. To avoid the appearance of discounting, Preysman developed a Choose What You Pay model for overstocked items, where customers can pick up, say, a dress shirt for one of three different prices. The website explains that the lowest one lets Everlane recoup its costs, while paying more allows it to invest in future product development. Twelve percent of shoppers opt to pay more. Everlane is the definition of championing transparency – and it pays off! They clearly articulate their brand values of ethics, price and design that differentiate them from other competitors. They market their brand values first, products second. Everlane is also smart about how to leverage inventory data. They strategically stock less and use wait lists, early access data and customer feedback to determine if/when they should stock more resulting in a strong pricing model and reduction of wasted inventory. 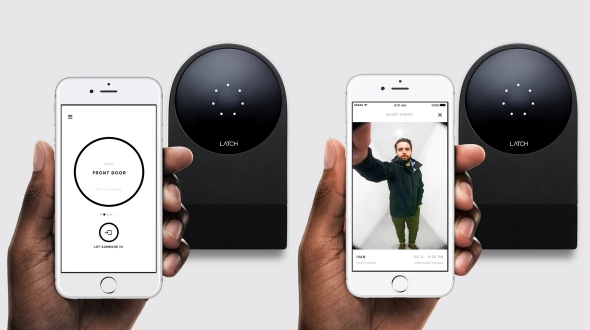 Latch, a competitor in the smart-lock space, revealed today that they will be the lock maker of choice for Airbnb’s newest housing experiment Niido. Latch is a patent lock system that would allow e-commerce orders to be delivered directly into a home – while offering access credentials to any service. Latch is only sold to managers running apartments and condos, for the simple fact that those managers buy in bulk and also face more complex problems related to building access. Users can use a key pad, phone or key card to get in to a building. The app allows for residents and managers to send out access codes to whoever they like that expire however long they designate. The delivery of hardware and service is the appeal for Niido – building managers can centrally manage all the Airbnb guest and create an accurate activity log. Every tenant using the service is charged $5 – as the lock itself is only an aspect of Latch’s business model. Niido is a new residential design concept specifically for home sharing. Tenants will sign annual leases and will be permitted to home share individual rooms or their entire units through Airbnb for up to 180 nights per year. Tenants who choose to share their homes will be part of Airbnb’s Friendly Buildings Program, in which hosts and landlords share revenues generated from home sharing. In a sea of smart locks, Latch stood out by targeting real estate developers rather than the average consumer – helping property managers navigate the operational burden with ease. Latch is demonstrating their value as more than a hardware or software company, and instead positioning the brand as a service that offers security, seamless access and simple management to consumers and customers alike. We’re moving towards a future where your user profile replaces your key.